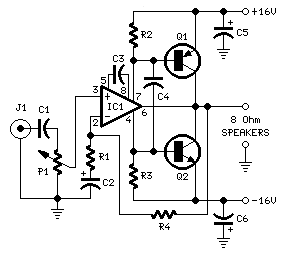 This amplifier was designed in order to fill the gap in the 3-10 Watts power output range of the audio amplifiers available on RED Free Circuit Designs. 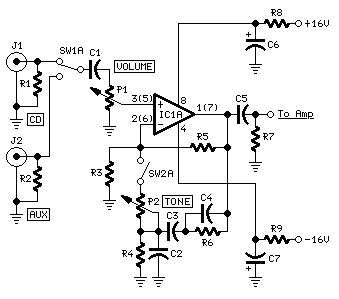 Therefore a simple, very low parts-count amplifier, was designed on the same guidelines of the successful 45 Watt Class B Amplifier, but using the excellent NE5534 IC instead of a discrete component op-amp to drive the output "dumper" transistors. Due to the maximum operating voltage restrictions of the chip, the output power cannot exceed 7.5 Watts into 8 Ohm loads, but the Total Harmonic Distortion figures are astonishingly low, much lower than comparable audio amplifiers using a single IC audio amp. Also due to the internal current limiting of the NE5534, the output power into 4 Ohm loads will be no more than 8 Watts. Other interesting features of this amplifier are the absence of any kind of setup and the possibility to be driven directly by the audio source (CD player, Tuner, iPod etc.). In any case, a simple, optional preamplifier circuit is provided, allowing to cope with very low output audio sources and featuring a single-knob bass and treble Tone Control. Though the amplifier can be driven into full power by many audio sources, this simple, optional preamp was devised. It allows to choose from two input sources by means of SW1 and provides a one-knob tone control (P2). As tone controls are usually employed only to increase bass and treble frequencies, this uncommon control type lifts of a very small amount these frequencies when its knob is rotated fully anticlockwise, gradually increasing them as the knob is rotated clockwise (see curves below). Opening the optional switch SW2, a perfectly flat frequency response will be obtained. The preamp is connected to the same power supply of the amplifier and its output should be connected to pin 3 of IC1 in the Power Amplifier. Obviously, J1, C1 and P1 of the Power Amp must be omitted (and shifted as part of the preamp). The power supply is straightforward. The parts values suggested are suited to power a stereo version of this design. For a mono amplifier a less powerful mains transformer can be used, having a 24V Center-tapped or 12 + 12V secondary winding rated at about 20VA or 0.8-1A. Either 2200µF or 3300µF filter capacitors will do the job, though the lower value is good for a mono version and the higher is well suited for stereo. Q1 and Q2 in the Power Amplifier should be mounted on the same finned heatsink, of about 80x40x25mm. For the stereo version of this project, IC1, R8, R9, C6 and C7 in the Preamp will be in common to both channels: therefore, only one item each is necessary. IC1 pin numbers in parentheses refer to the second op-amp available into the chip (IC1B).